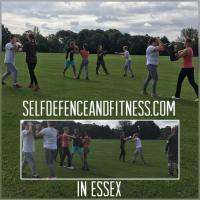 Self defence and fitness, teaches beginners' and advanced reality based self defence skills with all round body fitness, to both adults and youths, with venues in Brentwood and Chelmsford Essex. Students initially commence with a half day Beginners' Self Defence Induction for only £25.00. The Induction covers theory of personal safety, anti bullying, reasonable force and compliance, plus practical training including standing and floor based techniques. Training venues are mainly outdoors, however, there are some indoor venues. Beginners' Inductions are simply brilliant, positive, encouraging, challenging and always friendly & welcoming, if you have ever wanted to explore the opportunity to learn the life skill of self defence, contact me for more information and a chat. Students (Women, Men & Children) attending training have mixed abilities, strength, fitness, confidence levels and self esteem. Learning self defence techniques helps build confidence, strength and self esteem whilst improving fitness. All training sessions are great fun yet very effective. The techniques do not rely on strength. Most people have heard of Fight & Flight in a confrontational situation. The brain can ‘Freeze' in an attack, but we will help you develop a learned response to an attack, including various techniques using your voice. For prices please get in contact. Thank you. March 2015 Qualified Grade 2 UK SDMAG Self Defence Fitness Instructor and continue to develop my skills on an on-going basis. When I left school I knew I wanted to be involved in the security industry. With not a lot of experience in martial arts, I knew I needed some help. I looked on the Internet at various martial art classes but Combat Academy really stood out. I got in touch and within the week Richard contacted me. On my first session he made me feel very welcome and taught me a lot in very little time. Once my induction was over I attended Richard's sessions on a regular basis. His knowledge and experience has really brought me a long way since I started. He is patient, friendly, and has made me feel more confident in myself to tackle everyday life and the career I would like to pursue. I would recommend Combat Academy to anyone who wants to pursue a career like me, wants to learn self defence or to anybody who just wants to get fit and have a lot of fun at the same time. A great fun way to learn how to defend your self, build confidence and a hobby!! Richard makes all sessions effective and with a lesson to be learnt - he ensures all Students are comfortable and understand why and how certain moves are effective and to what extent!! All sessions are flexible around your availability which makes it great for me. I would definitely recommend it whether you just want to build your confidence or are traveling alone regularly. Richard puts his heart and soul into his sessions which is why I thoroughly enjoy them and have introduced my friends!! I usually attend Richard's classes in Chelmsford on Saturday mornings which are great fun, my fitness has really improved over the last few months. If I can't make the Saturday slots I sometimes go to the session in Brentwood on a Sunday morning instead, which is a great alternative. Combat Academy Chelmsford's Beginners Self Defence training covers Theory around Personal Safety, Anti Bullying, & Reasonable Force. The outdoor Practical session covers effective techniques and fitness, which helps to build confidence. My Instructor, Richard, always challenges me to improve and covers lots of different aspects including standing & floor techniques plus voice commands. Richard clearly loves his Instructor role, he is always positive and encouraging and very approachable if I'm unclear on what I'm learning. I would thoroughly recommend attending a session in Essex. Phone Richard and find out more about learning this valuable skill. Thanks Richard see you soon. My son is 17 years old, and very shy. I have been very worried about his shyness and decide to get him involved in activities, such as footballing and athletics, these did not work out until my daughter found Combat Academy. My son has been with Richard since January 2016, and he has been so incredible - very confident in what he does. My son can confidently go out now without me getting worried. He is able to defend himself from the tactics and instructions Richard has given him within few weeks. I have so far introduced 2 of my friends to Combat Academy so that Richard can assist in getting them out of their shells. Richard is very passionate about what he does - whether it is rainy or snowing, as he put his time and energy towards training his students. Thank you Richard. Richard Mitchener makes his sessions great fun and he clearly loves what he does. I thought self defence training would be intensely serious, but I was wrong - you learn through repetition & testing what you've learnt under pressure. Your fitness improves quickly if you attend regular sessions. The Combat Academy syllabus directly addresses my self-defence requirements, concerns even, whilst introducing me to effective and interesting martial arts styles. Richard\'s enthusiasm and talent for delivering the syllabus continues to improve my skills in precisely this order of priority; with a passionate focus on technical detail that 1) helps keep me safe, should the worst case scenario happen, and 2) keeps me enthused, as I gradually learn more about, and refine and practice, the mixed martial arts techniques that Combat Academy training uses.